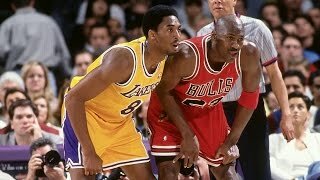 As Kobe Bryant is on the verge of passing Michael Jordan for third all-time on the NBA scoring list, take a look back at highlights of their head to head match-ups over the years. Posted By Persist ... Please click the “Report” button below if the video on this page is not working properly. Unless youre living under a rock, you are very well aware that Kobe Bryant is on the verge of passing Michael Jordan on the all-time scoring list. Throwback Lebron James vs Kobe Bryant Full Duel Highlights 2010.01.21 Cavaliers vs Lakers - SICK!